Saint Joseph Parish in Oil City was established in 1864 in response to the population growth resulting from the oil boom in the region. Following numerous years of significant parish growth, the current church was dedicated on June 26, 1894. In 1898, the territory of the parish was divided in half, with Saint Stephen Parish being erected on the south side of the Allegheny River and Saint Joseph Parish remaining on the north side. Assumption of the Blessed Virgin Mary Parish was erected in Oil City one year later, but this did not result in any additional loss of territory to Saint Joseph Parish, since Assumption of the Blessed Virgin Mary Parish was erected as a personal parish for Polish speaking Catholics and their descendants. 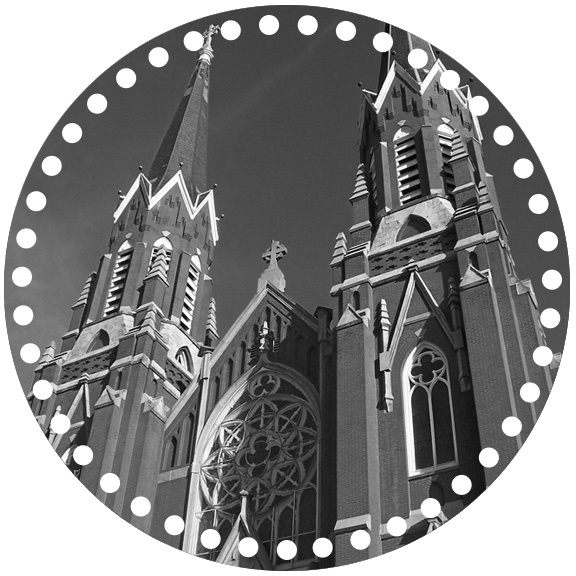 On November 8, 1914, a mission church of Saint Joseph Parish was blessed. It was known as Help of Christians Chapel and was intended specifically for the elderly and children of the Siverly area. On January 4, 1922 that mission community was erected as a parish with territory taken from Saint Joseph Parish, and the chapel was raised to the dignity of a parish church. With the loss of that territory in Siverly to Our Lady Help of Christians Parish, Saint Joseph Parish achieved its present form. St. Joseph Church, Oil City possesses the most illustrious history of any parish in the Diocese of Erie, except for the Cathedral in Erie. It all began with the discovery of oil in Titusville and the erection of a frame church on the top of the hill by it’s first pastor, The Reverend David Snively in 1865. He was succeeded in the fall of 1865 by the Reverend John D. Coady. Father Coady established the first school in 1869. His successor was the Reverend Thomas Carroll who met the challenge of a rapidly growing congregation. The pride and joy of his pastorate was the construction of the present church, on Cottage Hill. With its iconic, gothic cathedral spires the cornerstone of the church was laid on May 16, 1890. Four years later on June 26, 1984 it was dedicated by Bishop Mullen in the presence of more than 5,000 people. Father Carroll’s successor, the Very Reverend Peter J. Sheridan (1898-1921) the Vicar General of the Diocese of Erie, completed the building program initiated by Father Carroll. With the construction of a new school in 1903, and a new convent in 1904 Monsignor Sheridan was also responsible for the enlargement of a new St. Joseph cemetery. The Benedictine Sisters from Erie arrived in 1875 to staff the school. Upon the death of Monsignor Sheridan, the Reverend Edward M. Driscoll (1921-31) assumed the post as pastor of St. Joseph’s. He is remembered especially for his devotion to the sick and the construction of a new high school in 1930. As of 2017, St. Joseph Parish is home to 500 Catholic families and is the most visible and recognizable church in Oil City. In the 1890’s, a group of Polish-speaking Catholics in Oil City petitioned the Bishop of Erie for the creation of personal parish, and on April 3, 1899 Bishop John E. Fitmaurice erected Assumption of the Blessed Virgin Mary Parish for them and their descendents. Although the parish itself had no territory, the parish church was located within the confines of Saint Joseph Parish on the north side of the Allegheny River, and was dedicated on September 3, 1899. The current church was built and solemnly blessed on January 7, 1907. Throughout the twentieth century, Assumption of the Blessed Virgin Mary Parish continued to serve the spiritual needs of Oil City area Catholics of Polish heritage. In August of 1899, a group of Polish immigrants in Oil City petitioned Bishop Mullen to establish a church of their own. Bishop Mullen granted their request. The newly ordained Father Maximillian Polaski arrived shortly after his ordination and purchased an abandoned Presbyterian church which was dedicated on September 3, 1899. Within two years the converted church was so overcrowded that a new church was planned and constructed. The cornerstone was laid on July 22, 1906. Father Polaski remained as pastor until 1925 when he was appointed pastor of St. Joseph Church in Osceola Mills. The first school was established in 1906 in the former church. As of 2017, Assumption of The Blessed Virgin Mary is part of St. Joseph Parish. As noted above, Our Lady Help of Christians Parish was established in 1922 for the Siverly area of the greater Oil City region, specifically with territory which constituted the Tenth Ward at the time and which was taken from Saint Joseph Parish. The parish has not had a full-time pastor since 1968, and since then has mostly had parish administrators who also were assigned to duties at Venango Christian (later Venango Catholic) High School. This parish began as a chapel of St. Joseph’s church essentially to accommodate the elderly and families with young children, who found it difficult to attend St. Joseph Church on top of the hill. The new chapel, known as Help of Christians was blessed on November 8, 1914. Mass was celebrated on the same day by the beloved Monsignor Peter J. Sheridan through whose generosity the chapel was built. Monsignor Sheridan was pastor of St. Joseph Church. In 1921, Bishop John Mark Gannon decreed this chapel to be a parish church. The Reverend Alexis Fischer, longtime assistant pastor of St. Joseph’s was appointed the first resident pastor on January 4, 1922. Shortly, thereafter he was succeeded by the beloved Father Bartholomew McAvinue from 1922-1932. Father McAvinue was a veteran chaplain in WWI who established the parish on a permanent basis by making improvements and clearing all debts. Years later, the Reverend Francis Kaltenbach (1946-1961) set up the first social hall and religious education center. Religious instructions were given to the children of the congregation every Sunday by the Sisters of St. Benedict from St. Joseph Parish. As of 2017, Our Lady Help of Christians is part of St. Joseph Parish.